← Zygodactyl Feet? Who Me? It’s a cool, sunny day, about 70 degrees with a brisk breeze that results in me being bombarded with a hail of cotton puffs from the cottonwood trees. I settle myself at a picnic table a couple hundred yards uphill from the lake, and get busy typing. Of course I’m immediately distracted by the birds, but I remind myself that I will not be birding today. I’m here for writing. But I still have my binoculars (“bins” in birderspeak) and 300mm lens, just in case something incredible happens by. Just to get warmed up, the first couple paragraphs I type are about the birds I’m hearing and seeing. 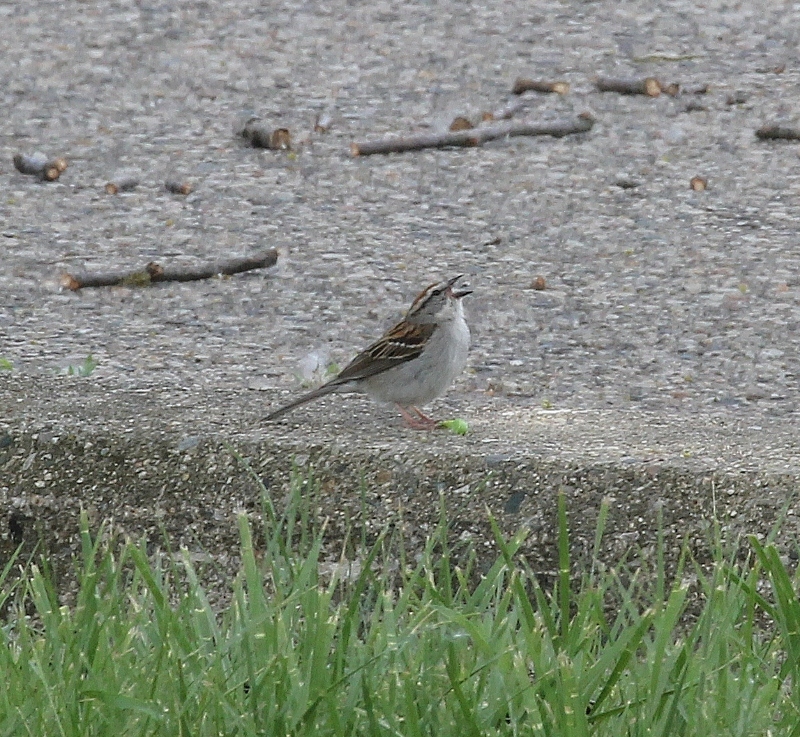 In particular, a chipping sparrow is singing constantly from the inner branches of the tree right in front of me. He even dropped down to the ground a couple times to nibble on a caterpillar or other delicious tidbit. I finally put down the bins and resume writing, chastising myself for my lack of focus. I make some good progress in the next hour, stopping periodically to look at the birds. Suddenly it dawns on me that I could write about the experience of birding in a single tree. That seemed an intriguing idea, so that’s what I’m doing. Pretty clever, huh? I’m writing, but I’m also birding. Two birds with one stone, so to speak. Before I tell you about the other birds, let me introduce our tree for the day. 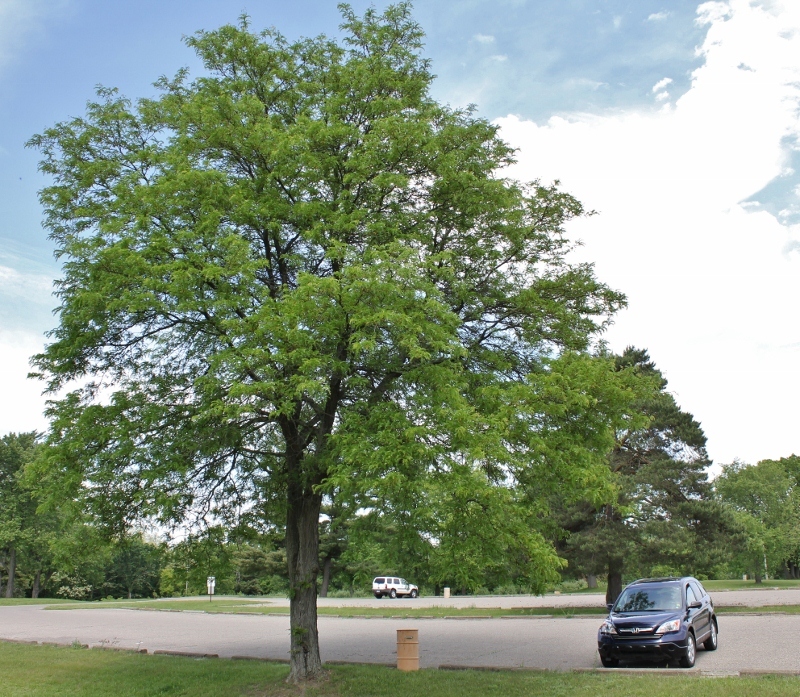 This is a 30-foot-tall black locust tree located on the edge of a parking lot. At least I think that’s what it is, after perusing two tree field guides. Other trees nearby include cottonwoods, various evergreens, oaks, elms, and many more I don’t know how to identify (yet). There’s a large lawn area too. 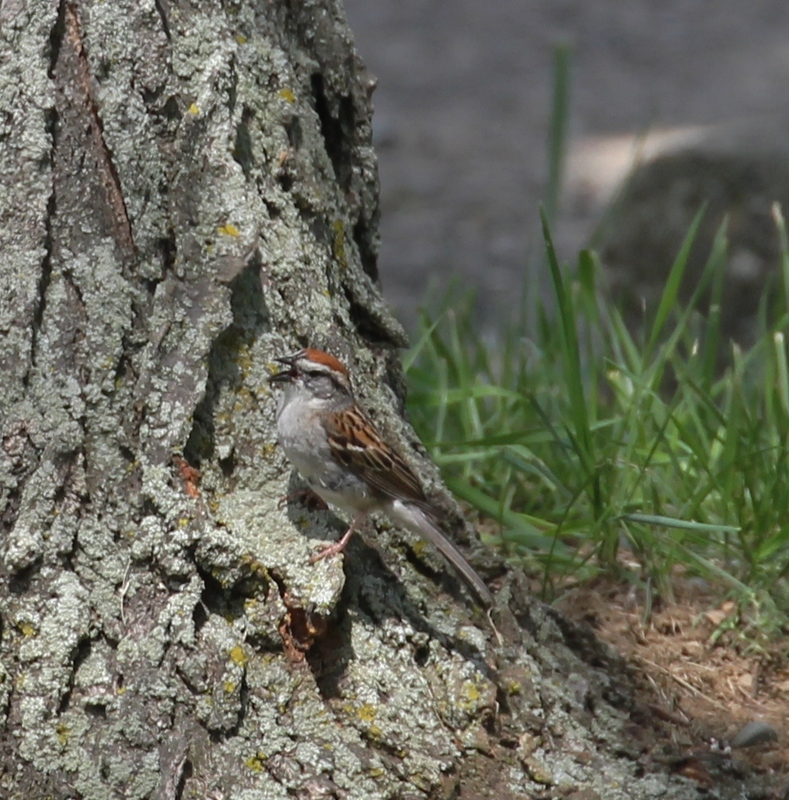 The little chipping sparrow appeared to “own” this tree, as he sang from it for the entire three hours I was there, entertaining me with his pretty little song. At one point I think I see a kingbird fly into the back side of the tree, but can’t confirm it. But 15 minutes later he pops into view on a branch right in front of me, posing nicely for his photo. I later watch him launching flycatching forays from the highest branches of the tree, grabbing insects midair. 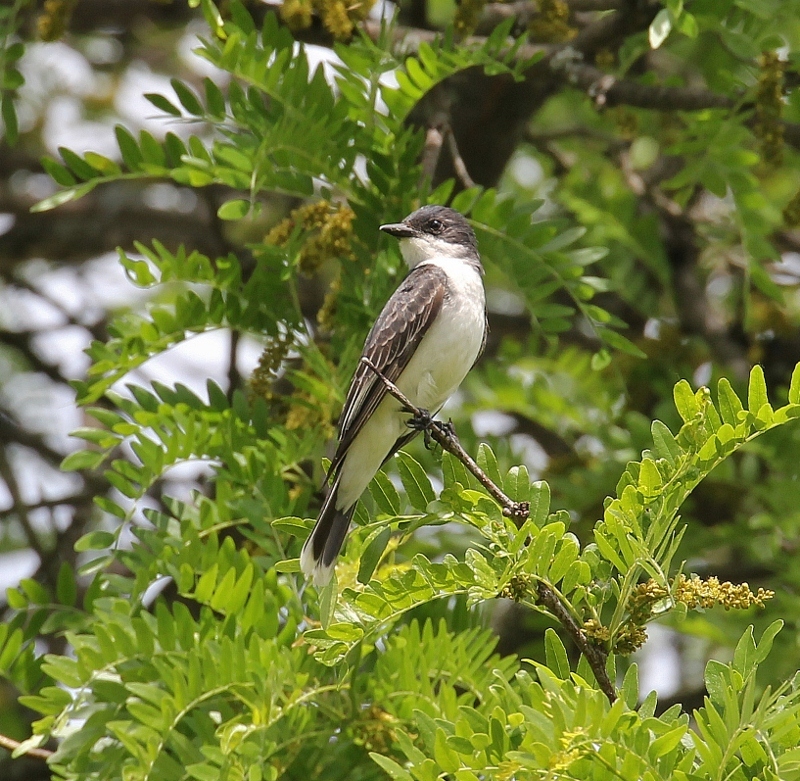 The kingbird is a member of the flycatcher family, birds that grab insects on the wing, often coming back to land again and again on the same branch. I’m always delighted to see this feat of timing and speed, not to mention eyesight. I can’t even see the insects they’re grabbing. Back to my notes. The writing workshop was led by Dr. J. Drew Lanham, a professor at Clemson University. This was my first time being taught by him, and I came out of that workshop with some notes that I know I’ll refer to many times in my future writing efforts. One of my favorites of his ideas was to pick up a leaf nearby when you see a special bird, and insert it into your field guide to remind you of how you felt and what you saw at that moment. So I stopped in my writing to bend down and gather up some of the cottonwood seedpuffs that were coating the grass. Now the breeze slows down and the air feels warmer. A robin starts singing loudly behind me. I can hear a blue-gray gnatcatcher in another tree nearby, and now goldfinches have gathered in the interior of our locust tree, softly chattering among themselves. A flicker announces his presence with his boisterous calls. 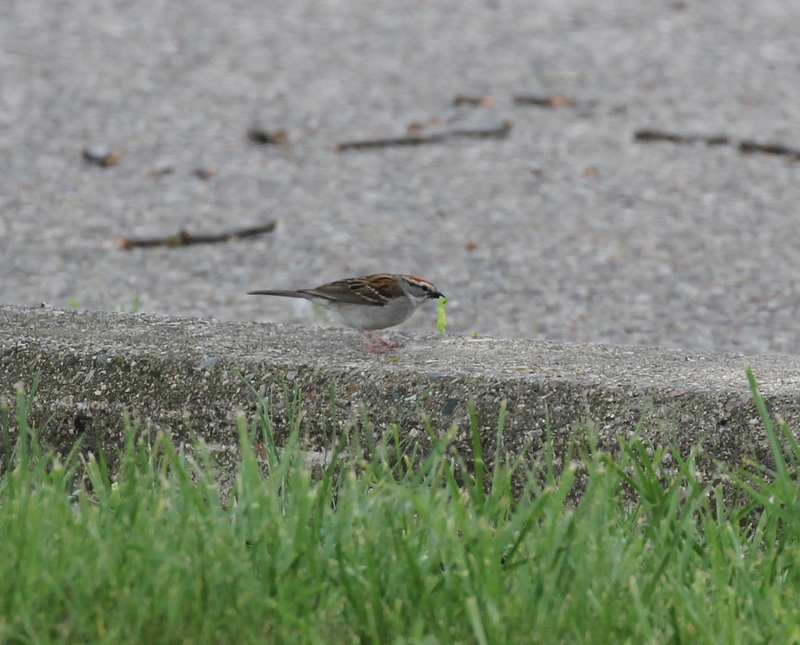 And still the chipping sparrow sings every five or ten seconds. Does he sing for the pleasure of it, or to get a mate, or to protect his territory? Possibly a bit of all those, I think. 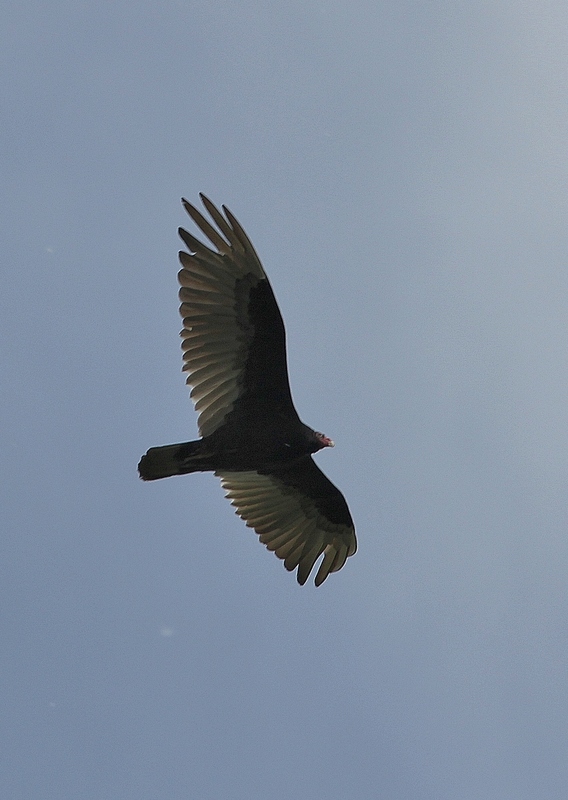 I stand up to stretch and see a turkey vulture soaring over our tree. As I sit down, some blue jays and crows are having an argument in the trees behind me. Two cowbirds land beneath the tree and walk around poking around in the grass. A chickadee is singing his sad-sounding two-note call in a nearby tree. 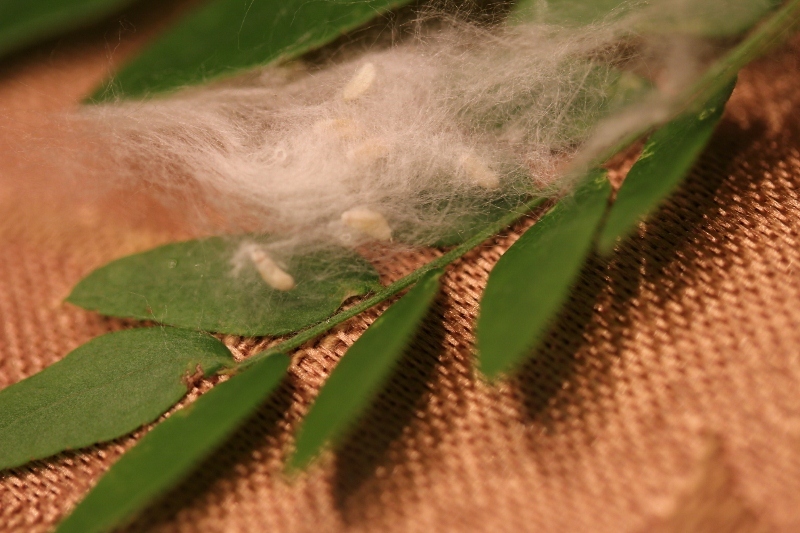 The breeze has brought a sweet smell now, from some plant I can’t see around me and can’t identify from the scent. But trust me, it’s lovely. I can’t inhale deeply enough. Maybe honeysuckle? 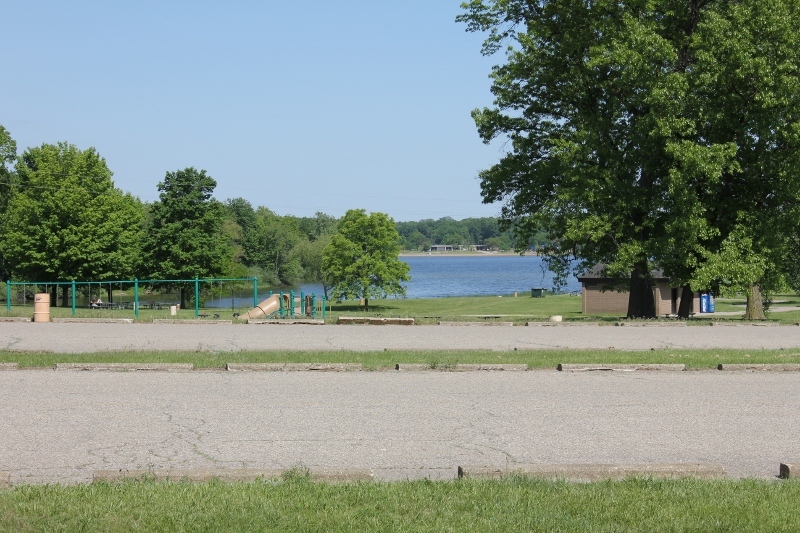 Down near the lake there are red-winged blackbirds calling occasionally. They seem to have already settled down from the noisy and aggressive early part of breeding season. A couple geese land in the lake as a red-bellied woodpecker makes a brief stop in our tree. I keep writing. I make good progress, ending up with two draft articles for future use. And, just because I’m compelled to record all the birds, here are the others who didn’t actually visit our tree: Northern Flicker, American Crow, Blue Jay, Red-winged Blackbirds, Canada Geese, Blue-gray Gnatcatcher, Turkey Vulture, American Robin, Gray Catbird, and Black-capped Chickadee. The sparrow is finally quiet and I find that I feel lonely without his pretty serenade to inspire me. I hope he’s taking a well-deserved nap up there in the cool interior of that lovely tree. I’m heading home, rejuvenated and relaxed, happy that I can share this peaceful afternoon with all of you. This entry was posted in Birds, Ecotherapy, Trees, Writing and tagged birding while writing, ecotherapy, extreme birding, nature, one tree birding, outdoors, tree hugging, trees. Bookmark the permalink. As for the writing, I’m finding that the harder I try, the harder it is. If I just let it sneak up on me it tends to work out! I often find myself checking out the many bird species in a specific area when I sit in the canyon. Many times I sat beneath a tree while Daisy deer bedded down or grazed nearby. I was always amazed at the winged critters that happened along. I did identify a bird call the other day that I had heard many times but never knew what it was. I wrongly thought it was a squirrel chattering or maybe some type of tree frog. It was a Yellow-Billed Cuckoo! I was so proud of myself… I couldn’t wait to tell you! Good for you! 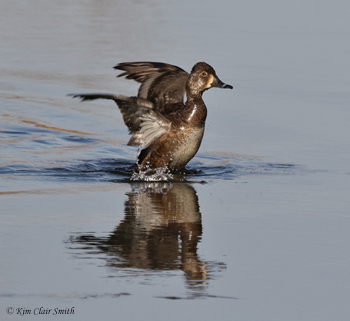 I always get a thrill when I finally identify a bird from its sound like that. They can be very confusing, and squirrels and blue jays can really fool you too. I enjoyed this post very much. How lovely to stay in one place and let the birds come to you! Thank you, Linda. It was a relaxing and eye-opening afternoon for me!